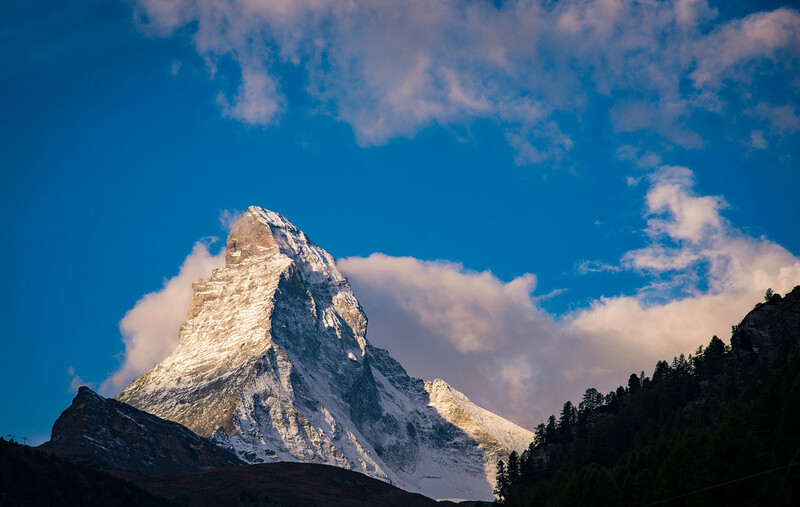 This covers our visit to Zermatt, Switzerland, where we spent approximately 85% of our time gazing longingly at the Matterhorn, which is arguably one of the most recognizable mountains in the world. Along with a recap of our trip, we’ll offer a few tips for seeing Zermatt, and thoughts on Switzerland, in general. In any case, this is the story of how Mark, Sarah and I found ourselves at the base of the Matterhorn in Zermatt, Switzerland on our recent trip to Europe. Actually, there isn’t much of a story. We ended up here because someone (whose name may or may not rhyme with Dark Zillard) forgot to book a hotel for the night. Before you curse Dark’s name, I have to say that this ranks as one of the best travel mistakes ever. While planning the trip, we debated as to whether we should visit Zermatt. Ultimately, Lake Geneva and Interlaken won out, and we decided that adding another stop would be too exhausting and too expensive. So, upon leaving the Lake Geneva region and discovering that our hotel stay in Interlaken didn’t begin until the following night, we faced a dilemma: do we visit a new destination or extend our hotel stay in Interlaken? It was a pretty unanimous decision to head for Zermatt, particularly when we found a great last-minute hotel price. After altering course to head towards Zermatt, we enjoyed a lovely drive through the Swiss Alps, and arrived at the parking structure near the train station in short order. Like many Swiss villages, Zermatt is a car-less town, and is only accessible to non-residents via a mountain shuttle train. I didn’t realize this before we began researching our trip, and it struck me as odd and antiquated when I first learned it, but it’s something I quickly came to appreciate during our visit. The shuttle/lift/train/whatever-you-want-to-call-it ride was really enjoyable, and offered some beautiful views of the mountains. Everything in Switzerland is overpriced by a good 25% (if not 50%+), but there are some places where you can plainly see the justification for this “mountain tax” and that ride was one of them. In what felt like no time at all, we were in Zermatt. I think the best way to describe Zermatt is by comparing it to the small towns found at the base of America’s most luxurious ski slopes in Colorado and California, except with a bygone European charm, and even higher-rent. It might not be everyone’s cup of tea, but we ate it up. Although cars do not cruise the mean streets of Zermatt, there are plenty of little cart-things (like a golf cart, but for snowy places, I suppose) to transport you to and fro. A line of these were waiting at the station, but we elected to hoff it to our hotel, instead. This turned out to be pretty easy, and had we not stopped 8238 times for photos of the Matterhorn, it would’ve been a 10 minute walk. Entering our hotel (“Hotel Holiday”) was like stepping into Wandering Oaken’s Trading Post and Sauna. The owner at the front desk was incredibly friendly, and provided a wealth of information, rules, and various tidbits about Zermatt. Once we knew the basics, we headed back out, eager to photograph the afternoon light kissing the face of the Matterhorn. Having done literally no research or virtual scouting ahead of time, we had no idea what our options might be in terms of photos. Instead, we raced around town, following the river, which most certainly led towards the mountain. Along the way, we saw crowds of people gathering on overpasses facing the Matterhorn to grab shots of that sweet, sweet late afternoon light. It’d be nearly impossible to take a bad photo of the Matterhorn, but we wanted something with more charm than a slew of buildings and the paved canal in the foreground. In any case, short of a color explosion at actual sunset time, the best light was already gone (the photo above was taken around 30 minutes before the one below, both before official sunset). 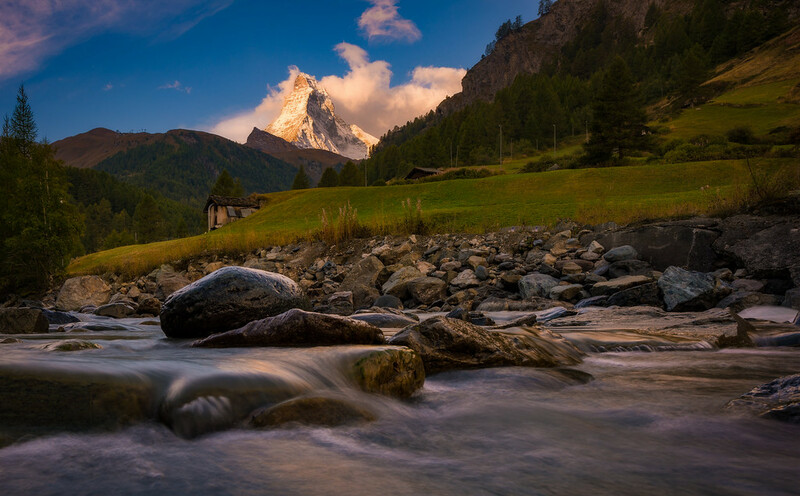 As with many mountain scenes, the best light for the Matterhorn is around an hour before sunset and after sunrise. By the time we ended up in what would be an acceptable spot, the soft afternoon glow of the light had given way to some pre-sunset color. At this point, it was a matter of waiting–and hoping–for the sky to light up. While that never happened, we did manage to scope out a spot for the following morning’s sunrise. Even if there is some degree of presenting an idyllic village that will align with tourist expectations, you get the sense that Zermatt is, for the most part, authentic. This would actually be a common trend throughout our time in Switzerland and Germany, as we questioned where the line was between the artifice and the authentic. It’s undoubtedly blurred, but all seemed mostly authentic. It’s difficult to explain what I mean by this, especially as it seems we have so few examples in the United States (perhaps some areas of Amish country?). In any case, it was undeniably enchanting, and I didn’t leg the question of authenticity nag. It was easy to suspend disbelief, if that’s even what I was doing, because the environments were simply so captivating and beautiful. After perusing what felt like every menu outside of the restaurants in Zermatt and being discouraged by the prices, we elected to cut our loses and just eat at McDonald’s. I know there are a lot of travelers who sneer at the idea of dining at McDonald’s while exploring the world but there is something to be said for a cheap, predictable meal in a place with free WiFi. In this case, the meal was not cheap. We ended up spending close to $30, and didn’t even order anything extravagant. We had heard Switzerland is one of the most expensive countries in the world to visit, and dropping $15/person on a basic McDonald’s meal really underscored that for us. The reason I’m sharing this photo instead of the final sunrise shot is because about 15 minutes before sunrise, all of the sudden the water level started rising. It was a trickle at first and I thought maybe early light was starting to melt snow, causing increased flow (I don’t know), but we both quickly realized something else was going on. We each scrambled to grab our open camera bags, which were sitting on rocks nearby, and quickly climbed upwards. Within seconds, the water level had risen significantly. It turned out that while crawling down into the basin, we missed a sign that warned of the flash flooding due to regulated releases of water. Oops. From that point on, we were pretty diligent about being mindful of the water level, lest a tsunami wave come along and carry us away. Fortunately, there was enough time to re-evaluate the scene and get setup before sunrise. 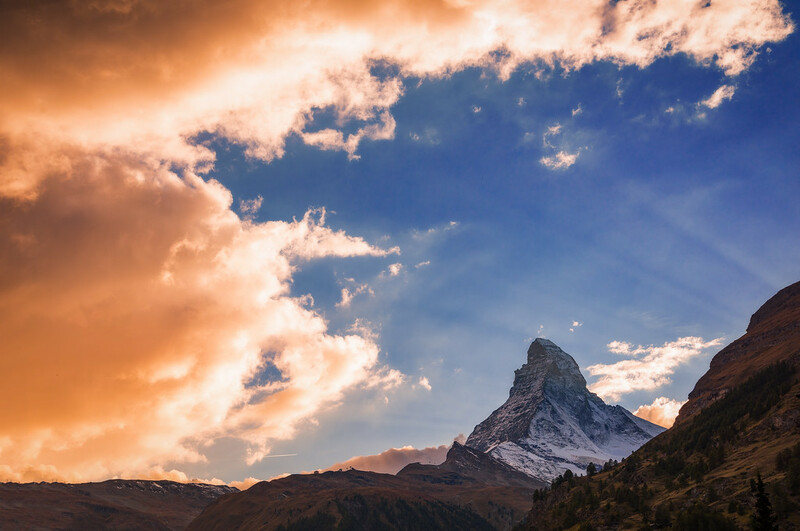 The morning light hitting the face of the Matterhorn was beautiful–probably prettier in person than is conveyed in these photos–but the clouds weren’t really anything special. I think we both were just happy that the defining characteristics of the mountain weren’t consumed by clouds…and that we didn’t drown. Upon arriving back at Hotel Holiday, we had got ready for the trek to Interlaken, but not before having a huge breakfast. If you want one takeaway from this post, it’s to take full advantage of the breakfast that is included with many/most hotel stays in Switzerland (and throughout Europe, really). Most mornings, we ate so much for breakfast that we didn’t need to eat again until dinner. Unless you’re willing to go to grocery stores to prepare your own lunch (which is really easy to do), meal costs can quickly balloon out of control in Switzerland if you’re not careful. After checking out of Hotel Holiday, we made the walk back to the train station, stopping several times to check out the shops along the way. Sarah purchased a Matterhorn chocolate, which was far better than Disneyland’s famed Matterhorn Macaroon, but it was also far, far more expensive. All in all, we had a great time in Zermatt. I’d love to go back to Switzerland at some point, but astronomical costs of pretty much everything give me pause about returning anytime soon. The amount of money we spent there constantly gnawed at the back of my mind, and I fear that returning before we have knocked off a ton of other bucket list destinations probably doesn’t make sense. Still, it was a great one and (for now) done, and we have no regrets about visiting. We’ll share more from Switzerland in future posts; for now, we’re curious to hear what you think, especially if you’ve been to Switzerland! If you thought Switzerland was expensive (and it is) you’ll probably want to avoid Norway, which is even more so. Zermatt was the first place I ever went in Europe some 25 years ago – and it was the bar of which all other travels there was set. A pretty high bar. We stayed at the Hotel Butterfly and I still dream about it to this day. My husband skied while I sat at a restaurant on the mountain and various European groups and families shared a table with me. It was – in my memory – the best food and hot chocolate I have ever had! I have often thought about going back but there are so many other places to see that it hasn’t happened. Ironically, our son and his girlfriend were touring Europe and winging it. He remembered us talking about Zermatt so they gave it a go – and skyped us from, yep, the Hotel Butterfly. Kind of surreal. Beautiful photos – and thanks for bringing back some great memories! I would hazard a guess that much of Zermatt looks today exactly as you remember from 25 years ago. Some stores have probably changed, but so much of that town (and many in Europe) have a timeless quality that means a lot less change than cities in the US! Visited Switzerland on a choir trip with my family a few years back and it was probably my favorite country we explored. We experienced the Jungfrau just outside of Interlaken and we just wanted more time up there (we were only allowed a few hours). There were lots of activities at the top of the mountain that we just didn’t have time for but looked really fun! Switzerland is definitely on my list of countries to return to! We really wanted to do Jungfrau, but just couldn’t justify the cost. It looked absolutely gorgeous, but spending so much on top of what we had already spent on the trip was just out of the question for us. We did do a different lift and hike combo that we both loved (I’ll write on that later). Beautiful photos, I’m glad for the readers’ sake that your plans changed! I’ve visited Switzerland twice for work (never Zermatt) and would love to vacation with my family some day. But I have the same tourism concern – price. When I last went (2008) a McDonalds meal that would have been $5 USD locally cost ~$18.50. Ouch. The cheapest meal otherwise was probably $35, and I wasn’t eating at fancy places. I really like the sunrise picture. Do you know what the building in the foreground is? A barn? There seems to be some big metal curving pipe coming from it. We did one table service meal in Switzerland, and it ended up costing over $40 per person for what we both thought was mediocre food. I couldn’t believe how overpriced even McDonald’s was–grocery stores are definitely the way to go in Switzerland.